My grandma is 102 years old. I’ve written about her before a few years ago in a post featuring John Mellencamp. I’m still astounded in the life that she has led and the things she has seen – growing up in small Oklahoma panhandle town, marrying into a ranching family, moving to Osage County in Oklahoma, and then living a widow’s life now for the better part of 40+ years. When you consider that there are normally 365 days in a year and 8,760 hours in a year, it’s hard to comprehend that she’s lived over 37,000 days and 880,000 hours. I’ve been having some uncomfortable conversations with God recently. We had to move my grandma about six or seven months ago into a nursing home. It’s one of those places that you hope you don’t ever end up in because it basically means you’ve exhausted your resources and must go to a living facility that accepts medicaid as payment to provide roof and shelter and food. And that’s where my grandma has ended up. In all fairness, not many people plan on living this long so even though she planned and saved well here we are. Still, I often wonder what kind of purpose or plan God has for my grandma at this point in her life. She’s forgetting more and more things and repeating stories and requests more often. She doesn’t feel well all the time. She complains of nausea and constipation constantly and it’s an unwavering battle to determine what is causing this. Sometimes she’ll leave me four or five voicemail messages within a 30 minute window (she still knows how to dial that phone!). She once left me 17 messages in one day. The messages all usually pertain to the need she has has for some nausea tablets and ex-lax. Occasionally there may be a request for juice or hearing aid batteries, but she doesn’t feel well and is searching her memory for anything that may help her. She spells ex-lax out for me every time including saying the word “dash” in between the “x” and the “l” – she says e, x, dash, l, a, x.” Both are non prescription so I don’t need a doctor’s order she tells me. No matter that the nurses at the facility provide her with these types of medications as needed, she thinks the nausea pills and ex-lax are the only cure and they are way better then what the nurses can provide. It doesn’t do me much good to try and tell her that’s why the nurses are there. She doesn’t think they care and that’s sad. I love my grandma. I hate seeing her in misery. I hate seeing her slowly lose her mind, and I continue to wonder – what’s the purpose? What’s the plan? Is God teaching me something through this? Surely, but at a cost of a beloved family member? It’s difficult to accept and it makes me angry. Grandma still has funny stories to repeat and share and I try to make her smile and laugh, but it’s not always easy. It’s depressing there, but my grandma has a beautiful smile and laugh. It’s fleeting and short-lived these days as she tells me things like she doesn’t like to wake up early because it just makes the day that much longer. Like I said, sad. I often think about Paul and his letter to Timothy where he talks about fighting the good fight, keeping the faith, and finishing the race. I realize Paul was in prison and was eventually beheaded, but he was proclaiming that he had done all he could do and was ready to cross the finish line into Heaven. What’s left of the race for my grandma? Not much and I know this, but why must she suffer? I will continue to ask and I will continue to suffer along with her, but I will also continue to try and make her smile. Besides the obvious correlation with time for this post, this group/song/album is not void of another meaning. 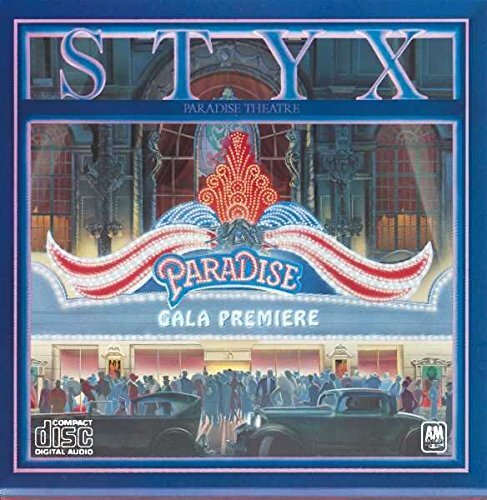 My grandma bought me Styx’ Paradise Theatre album as a birthday present when I was 10. I think it may have been the only music she ever bought me. I remember it because of that and also because 1) she made mention that it was apparently a very popular album (it peaked at #1 for three weeks on the album charts in April and May of 1981) and 2) even when I was 10 I somehow knew that Styx was also the name of a river in Hell and I thought how funny that my Jesus-loving, Sunday-School-teaching grandma would buy me album with a band that claims the name of a river in Hell (even though I’ve learned that Dennis DeYoung is a devout Catholic). To be honest, today’s featured song wasn’t necessarily a favorite of mine. I much preferred Dennis DeYoung’s vocals on tracks like “The Best of Times” and “Rockin’ the Paradise.” This was Tommy Shaw’s only top 10 track as lead vocalist for Styx and his lyrics were loosely based off of a bar he frequented in a small town in Michigan where he lived. The video is the classic definition of an early MTV cheesy video. It’s hilariously bad as the band members try hard to make funny faces, gestures, and do their best to ham it up in the bar scenes of the video by trying to impress the ladies and lighting cigarettes with 100 dollar bills. As an added bonus I stumbled across this bit done a few years ago by Jimmy Fallon and Paul Rudd as they re-enacted the video to hilarious precision. As always, thanks for reading, and a thank you to my grandma for introducing me to Styx through this album, and may you the reader enjoy the time that you have on your hands. This entry was posted in Uncategorized and tagged Dennis DeYoung, grandma, Paradise Theatre, Styx, time, Tommy Shaw, Too Much Time on My Hands. Bookmark the permalink.